2) Click on Media in the Menu bar. 3) In the dropdown menu, click on Convert/Save. Alternatively, you can press Ctrl+R to directly reach media options. 4) Click on the Add button on the right of the File selection box to load the video whose format you want to change. 5) Click on Convert/Save button. 6) In the following dialog box, click on browse to select the destination where your converted video will be saved. 7) In the profile selection option, select from a pre-configured profile of the output or customize it by clicking on the Settings icon on its right. You can select from a range of encapsulation, video and audio formats in the following dialog box if you wish to customize the output. 8) Click on Start to begin conversion. 9) VLC's progress bar will show progress. Do not close the player when it is converting videos as it will result in output video getting corrupted. The speed with which VLC converts videos depends upon your computer's specifications. A faster computer converts faster while slower PCs take a lot of time. At the end of the conversion process, you will get the video in the format that you have selected in step 6. Resizing the video involves making minor changes in the steps followed in conversion. 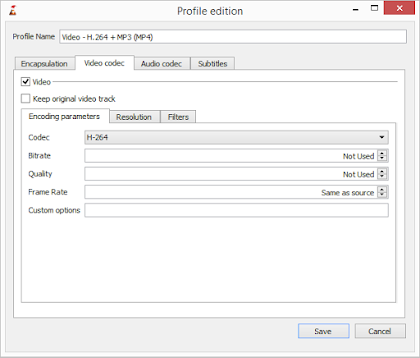 While customizing the profile in step 7, go to the Video codec tab. Inside the Resolution tab, enter the desired width and height that you deem fit for your needs. After that, just convert the video as you normally would. This would result in the output video having the same dimensions that you specified. However, it is important to note that exact dimensions would only be achieved if the aspect ratio of the video is maintained. If the correct aspect ratio is not satisfied by your dimensions, VLC will take one of your dimension and change the other to satisfy it. To crop videos with VLC media player, go to the menu bar and click on View menu. Inside it, check Advanced Controls. This will result in a few extra buttons over the normal toolbar. Play the video of your choice and press the record button (from the newly added buttons) at the point in the video from where you want to start. Then, again press this button when the video reaches the point at which you want to stop it. The cut video will automatically be saved in your Videos library. It is located at Libraries/Videos in Windows 10, Windows 8.1, Windows 8, Windows 7 and Windows Vista. In Windows XP, it is located at My Documents\My Videos. You can use the Frame by Frame button to get a high degree of accuracy. You need to install the newer versions of this program as older versions do not support this. Related: A better way to cut videos with VLC. The record button isn't very accurate. When I hit it, even when I use the frame-by-frame feature, the recorded video starts a few seconds later than the place I started recording. How do I fix this? Download the latest version. It might be a problem with the version installed on your PC. I'm so amazed at the great job you're doing in here. At last, a good well designed website running under Blogger platform. I mean you deserve a handshake! Cutting (or what I call Trimming) an AVI video gives me only an audio recording. I thought this was because I was running VLC on my mac so I have now tried running it on a VISTA Windows machine and have the same problem. THe file extension i get on the trimmed file is .AVI-.wav in case that helps get someone to figure out why it doesn’t work. @Anonymous: Incorrect settings are the reason why it is being saved as a .WAV file. Check your settings. I always have searched a lot of converter tools but VLC already have these features. Thanks a lot.